Home / 8-mcdo / bank of the philippine islands / bpi / bpi-i.can / delivery / food / mcdonald's / mobile mall / technology / McDonald's Goes for Another 24/7! McDonald's Goes for Another 24/7! With the first one-number delivery system as 8-McDo last 2002, the 24/7 Delivery Service last 2005, the online delivery website www.mcdelivery.com.ph last 2009, and the no-minimum food purchase requirement last year, McDonald’s once again take the delivery service of food purchases in our country to another level as they introduce another first. 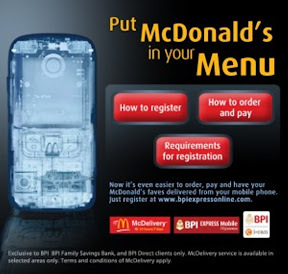 Presenting, McDonald's first cashless mobile ordering system - BPI-i.Can! Yes, you read it right! 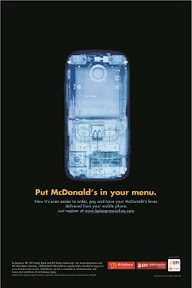 With the fast-changing life and the fast-changing needs of their dear followers, McDonald's take their business - delivery service - into a cashless mobile ordering system together with one of the leading banks in the country - Bank of the Philippine Islands (BPI). Now, all BPI account users can have the best of both worlds through BPI-i.Can Mobile Mall. It is important that the BPI account user must be registered to the BPI Express Mobile Service to enable downloading and activating the BPI-i.Can Mobile Mall applet on their mobile phones. It is so easy to use, really. And once you learned this one, I'm sure that you'll enjoy your McDonald's favorites even more. Share this good news to your friends and family and enjoy McDonald's French fries, Big Mac, Cheeseburger, Chicken McDo, McSpaghetti and even Hot Fudge Sundae at your own comfort zone! With these great advancement to food delivery, I'm sure other food establishments will follow. Cheers to McDonald's! And happy eating to everyone!